Pathfinders of the Golden Trail - Existed at Lancaster County Council, Pennsylvania and at Susquehanna Council, Pennsylvania. The group was founded by Troop 31, Richmond, Virginia in December 1914. The name was originallly the Dagger Society and the name was changed in the Spring of 1915. A plan to form a National organization began in 1917 when PGT was organized in Racine, Wisconsin and Madison, New York. It then spread to Camp Allamuchy (Newark, NJ). PGT disappeared from Richmond in 1919 (When WWW came to Richmond Scout Summer Camp). In 1919 the Society was established at Camp Caesar Rodney (Wilmington Delaware). Also in 1919 the Society came to Jacksonville Florida where the Seminole Tribe was formed. Later we know that the society developed in Susquehanna County Council where it was replaced by the Order of the Arrow. It also existed at Lancaster County Council, Pennsylvania. The three patch images are from the Seminole Tribe in Jacksonville, Florida. Brown Tepee means "Little and Big Lodge"; Red is Medicine Lodge and Blue means Blue Lodge. In this case "Lodge" is a reference to an office per their constitution. 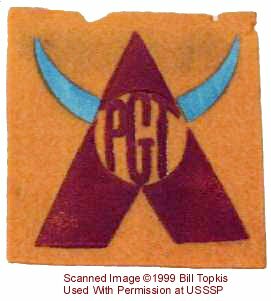 The silk neckerchief with a turtle and the greek letters Pi Gamma Tau (PGT) is believed to be from the Wilmington, Delaware tribe. It is one of two known. The PGT pin is the only item scaled at 200% actual size. This example came out of the Susquehanna Valley. The story on these pins is that most were destroyed by PGT members when they learned that the Society was to be disbanded by their Scout Executive (apparently the last tribe remaining) in 1946 in favor of WWW. They were ordered to destory their pins. The remaining examples would come from two sources; those that disobeyed the order (doubtful that many if any disobeyed the order); those that did not learn of the order to destroy the pins. 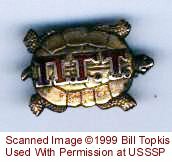 The owner of the pin that is pictured was still abroad serving in W.W. II. The membership card came from the Susquahanna Valley Council. Our thanks to Bill Topkis for the above information.